Today’s love-filled photos come directly from the a southern Italian beach town, the home of Charlie, who writes the blog Figs and Lemons and sells amazing soap products at Saponissimo. 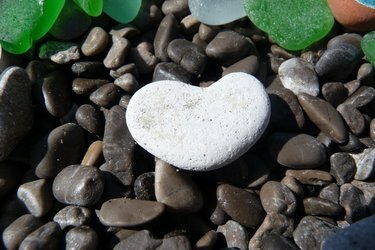 I found this stone on the beach and thought of you!!! Whee! Love *is* all around! Anyone else dreaming of a vacation on an Italian beach now? And Happy Italian Father’s Day Dad! Happy Saint Joseph’s Day and Happy Love Thursday to you! Please eat a nice big Zeppole for your poor readers. I love sea glass and I always collect white stones from the seaside and bring them home. I have a lovely blue glass bowl that I keep them in. 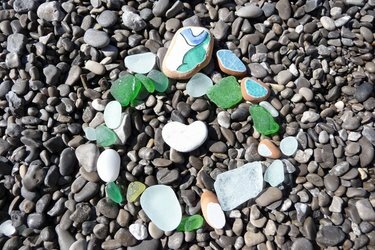 I love sea glass too…I don’t find nearly enough…. I think Spring brings love in the air period… I agree, love is all around and I’m sure I could find some on an Italian beach! Yes I wish I was on vacation on an Italian beach. Always being contrary to eveybody else, I’m dreaming of the English countryside! Hopefully I’m going tomorrow! Well yes, too much southern Italian beach sometimes mean not enough home…. I can not wait to be in Italy, hopefully this summer! We have been teased with sporadic warmer days here on the East Coast and those days really make me long for the sand and surf of Puglia (or any beach in Italy for that matter)! Lisa’s last blog post..Happy Love Thursday! Don’t worry–we’ve been teased here as well. They say it’s supposed to snow tonight/early tomorrow morning in the mountains of Calabria! I love when little signs enter our worlds, just like yours, and says….Smile, silly – you are loved! Katie in MA’s last blog post..The love that remains the same. Awwww. I love finding love in unexpected, simple places. Me too 🙂 Thanks for coming by! I’m always dreaming of a vacation on any beach! Love to all on this gorgeous Thursday! Yes, I’d love to be on an Italian beach. Next week we’ll be in Torino to visit Marco’s family. What I want to know is why we’ve never been to his family’s vacation condo in Diamante nor to his family domain (twin-sister spinster aunt still living in the house where she and his mother grew up) in Sicily!!! Oh you definitely need to come down here! Perhaps for the peperoncino festival in Diamante in September?! Lovely thoughts appearing as I stare at the photos. And my cocker spaniel, Riley, who is an accomplished rock hound with a grand collection, would absolutely love the place. vikksimmons’s last blog post..I write fiction. I don’t need no stinkin’ social network. Lovely photos! So it is not just me and the heart shaped rocks on these Southern Italian beaches. I have gathered a whole pile of them! (How can you leave a heart shaped rock behind once you find it??) I found one during one of the first times I was swimming in Amalfi with my boyfriend, and I carried it around in my pocket for months and months. Then I started finding them almost everytime I went to the beach last year. They say the Amalfi Coast is romantic . . . it is even in the rocks!! Thanks for making me smile! Yes, today is Father’s Day in Italy… thanks for reminding me this! I should call my Dad NOW!!! Oh bother is right…SNOW yesterday here! Isn’t it great to be thought of in love? I’ve got a little collection of beach glass going myself–I love the contrast of color! Michelle at Scribbit’s last blog post..Maybe More Volcanoes Are What I Need . . .
Gorgeous isn’t it? And free! Woohoo! anne’s last blog post..A Small French Market in Oxfordshire…. Late in saying… Very cool! Love the photos and that Charlie thought of you and Love Thursday. girasoli’s last blog post..decisions decisions… Arezzo or ?? I am absolutely planning on visiting Italy for 2 1/2 weeks next spring. It’s on the calendar! Can’t wait to see the beaches. Yay! Woohoo! Come on over!